WARNING: If you put a restriction on your student's iPad, you MUST share the passcode with the homeroom teacher AND one of the technology integration specialists. Failure to do this WILL impede on your student's ability to participate in some classroom activities. 2. On the left side, choose "General Settings." On the right side of the screen, scroll down and tap on "Restrictions." 3. Tap on "Enable Restrictions." You will then be prompted to enter a passcode two-times. BE SURE TO SHARE THIS PASSCODE WITH YOUR STUDENT'S HOMEROOM TEACHER AND TECHNOLOGY INTEGRATION SPECIALIST. 5. You can also restrict or block websites that your students can access. THIS WILL AFFECT YOUR STUDENT'S ABILITY TO PARTICIPATE IN CLASS ACTIVITIES, SO MAKE SURE TO SHARE THE PASSCODE WITH THE HOMEROOM TEACHER AND THE TECH SPECIALIST. 6. 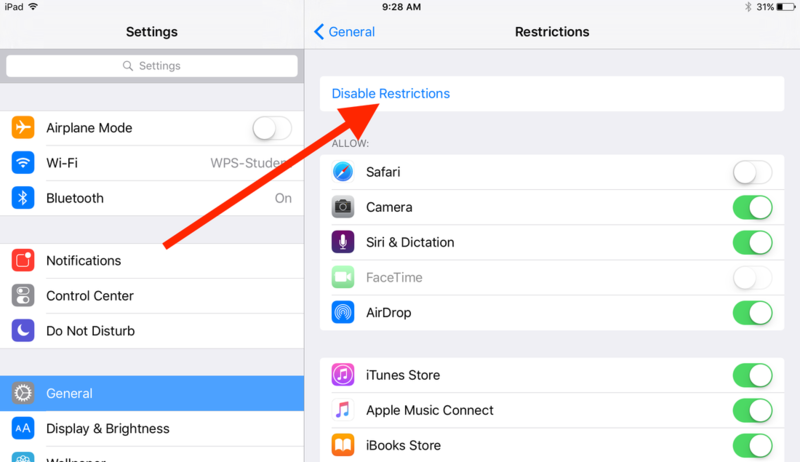 To turn off the restrictions, you must go back into General Settings--> Restrictions and then choose "Disable Restrictions." You will then be prompted to enter in the same passcode you used to enable restriction.